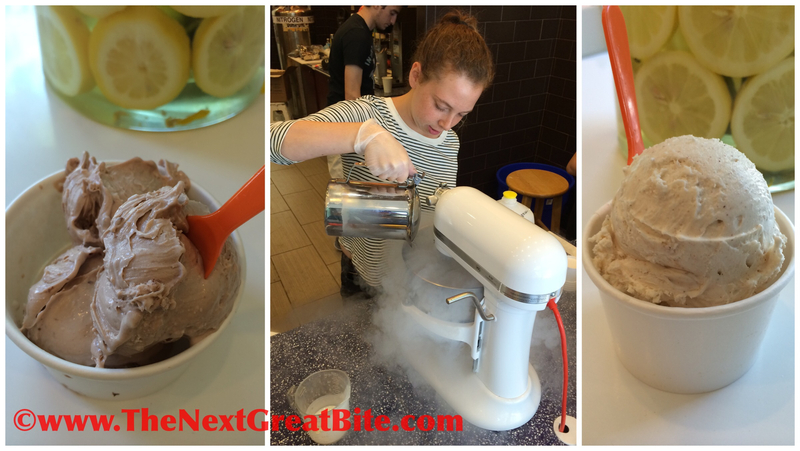 Nutella ice cream; Nicecream employee blending the ingredients in the KitchenAid and adding the liquid nitrogen; Spiced Vanilla ice cream. Are you looking for a new place to try this Memorial Day weekend? Why not head over to Nicecream Factory in the Clarendon area of Arlington. Here is why I think it is worth the trip. When I first read about the Nicecream Factory concept, I could not wait to go try it. The idea that their ice cream is created in front of the customer and made with farm fresh ingredients sold me. No additives, no preservatives just good clean eating. Real food! I was not disappointed. Nicecream Factory features 4 flavors of the day. On my visit, they had Lemony Jenny, Chocolate Banana Split, Spiced Vanilla and Nutella. We went for the Spiced Vanilla and Nutella. The fresh cream is added to the kitchen aid blender along with the flavor you choose. The liquid nitrogen is then added to the mixer which hardens the mixture quickly. That alone is just a wow visual and great fun to watch. How does it taste? Amazing! The ice cream is so creamy and sweet. I compare the taste to the gelato in Italy where I personally indulged in gelato everyday because it was made fresh everyday. Now I don’t have to wait to go to Italy to have fresh ice cream. I can go to this store in Arlington to have this sweet indulgent!